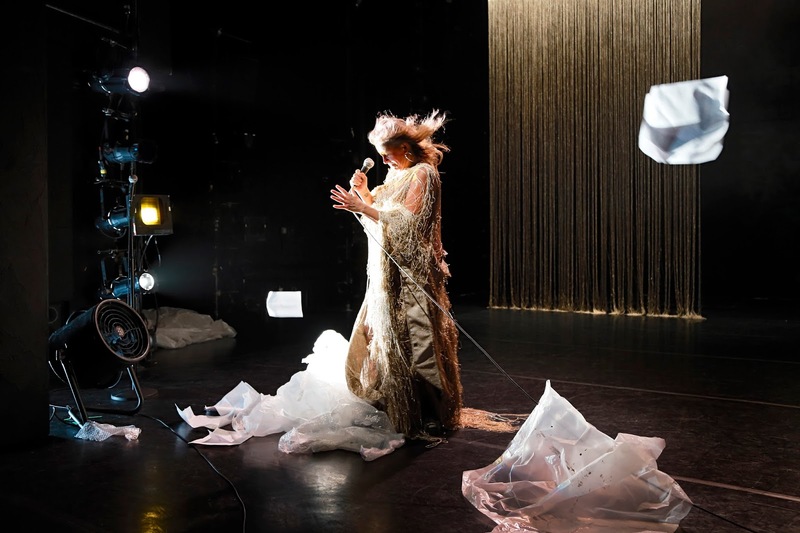 Adrienne Truscott brought her adaptable THIS show to American Realness 2018 at Abrons Arts Center's Playhouse, and I caught that final performance on the night also marking AR's finale. The APAP conference, too, drew to its close Tuesday morning, although there are APAP-targeted festivities (PSNY's COIL shows; Under The Radar's added week for the great Split Britches duo) still going strong this week. So, what exactly is THIS? And who exactly is Truscott? The answer to both seems to be: A LOT. Also, probably, IT DEPENDS. The woman has worked through numerous genres--from dance to writing to circus to cabaret and stand-up comedy--and THIS draws liberally from her history. Which is what makes it such a fun, elusive and magical this. magician's sleight of hand, which is what THIS turns out to be. Anything can appear and disappear when we least expect it--elements of decor; running narratives that abruptly stop and run away and...wait...run back, then vanish again so you don't know where they were supposed to be taking you; a mechanical bird that flies prettily until...oh, no...it doesn't; and a performer who sometimes hides behind scenery even as she continues to talk to us. What to make of it? It's such a...such a...thing, this THIS, and the audience I sat among--mainly young, I noticed--loved it hard and answered it with a big roar. If you did not see this THIS but you happen get another chance to see THIS, I suspect you will see a somewhat different THIS. But, no worries. You will see Truscott--trust--and she is always worth it, no matter who shows up onstage. Closed. For general information on American Realness 2018, click here.